Once, these neighborhoods weren't so nice after dark. But things change when districts gentrify. NEW YORK (CNN/Money) - A few years ago, that neighborhood was definitely on the wrong side of the tracks. Now, it boasts three Starbucks, a yoga studio, and a really cool jazz bar. Yes Virginia, the yuppies have arrived. The gentrification wave started -- or perhaps re-started -- in the 1970s, when places like Manhattan's Soho district began attracting residents to formerly decrepit industrial zones. Many years later, the trend continues, not just in New York, but across the country. "Urban gentrification makes sense because [it is] taking areas close to the city center and making them better," said Paul F. Purcell, a partner in Braddock + Purcell, a real estate consulting firm. Downtown San Diego, for example, had been a neglected commercial area. A handful of condos started popping up in the area in the mid-1980s, shortly after Horton Plaza, a retail shopping complex, opened. But a late-1980s recession put an end to that effort. It wasn't until developers broke ground on Petco Park, the new home of the San Diego Padres, four years ago that the East Village began finally "to emerge as a desirable place to live," said Rich Gustafson, president of CityMark Development in San Diego. Fast forward to today. Gustafson is working on two buildings in the area, the M2i and the Fahrenheit, both of which are scheduled to open next year. Amenities include gated underground parking, floor-to-ceiling windows, and 11 to 14 foot ceilings. Units range from $300,000 to roughly $700,000. Los Angeles is undergoing a similar revitalization, as developers rush to build the area near the Staples Center. One firm, Gerding/Edlen, will break ground in September on the Elleven, the area's first new-construction condo development in more than 20 years. Prices are expected to range from a low of $300,000 to $1 million. Meanwhile back East, Washingtonians are steadily snapping up property in Logan Circle, where condos are now going for $350,000 and up. In nearby Baltimore, houses are now selling for $300,000 to $400,000 in Canton versus $35,000 to $40,000 in the early 1990s. These urban areas are barely on the radar screen, but in a couple of years they may be seen as the next big thing. Oregon Health & Science University is expanding its Portland campus, sparking greater interest for housing along the city's south waterfront district. The $1.9 billion South Waterfront development, which is the area's most ambitious project, will include a 150 to 200 room hotel and conference facility, research and clinical facilities for the university, and more than 2,000 market-rate condos and apartments. 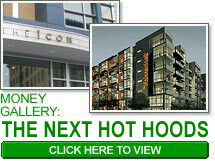 Its first residential unit, the Meriwether, will open in spring 2006, amid heavy consumer demand. "We don't have a sales office, we don't have a Web site, and we didn't advertise," said Homer Williams, a principal with developer Williams & Dame. "Yet we already have half the building reserved. It's going along much better than we anticipated." Prices range from $249,000 for a one-bedroom in the west tower to $1.47 million for an east tower penthouse. Miami is continuing to shake things up with several new projects going on in its downtown center. One such project, Metropolitan Miami, combines 1,500 residential units with a mix of commercial and retail space. "You have to have people living in an area in order to really entice the development of the area and the services that people are looking for," said Tim Weller, vice president of development at MDM Development Group. The first residential tower, Met 1, is scheduled to open next September yet approximately 85 percent of the units have already been sold. Prices range from $180,00 to $1 million plus with the average unit selling for about $350,000. Not to be outdone, the area surrounding Dallas' old Union Pacific Railroad and power plant was once a contaminated, brownfield site. Soon, it will give way to a modern, mixed-used district. The American Airlines Center, which opened in 2001, is the catalyst for the area's renewal. Shortly after Dallas residents approved the Center's construction with a $125 million referendum in 1998, Hillwood bought roughly 77 acres of land around the area to develop Victory, a high-end residential, retail and commercial district. They have successfully lured the upscale W hotel chain to the area, to develop a hotel/condo complex. Scheduled to open in spring 2006, it has pre-sold 91 percent of its residential units.